For the quality assurance of 3D-printed medical implants, Baltic Orthoservice uses the LC15Dx laser scanner on an ALTERA CMM. The goal is to guarantee the absolute best quality of product for its patients and to make patient specific implants more readily available. Baltic Orthoservice uses the LC15Dx laser scanner for quality assurance of its implants. This in an example of a 3D-printed patient-specific implant – GIGIT. 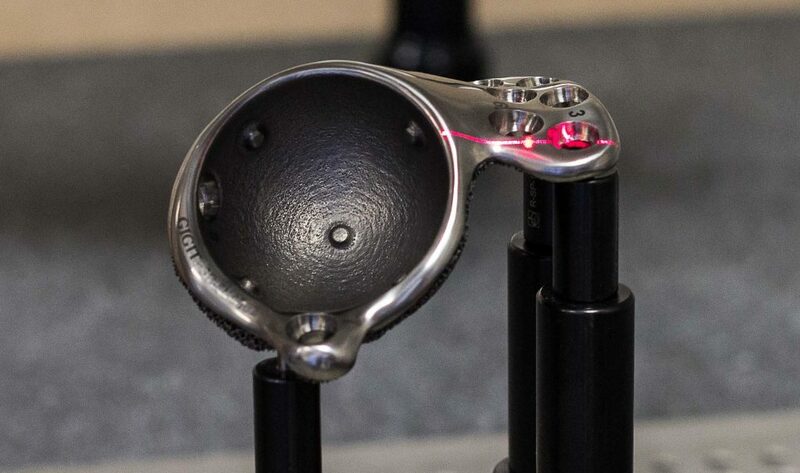 With the capabilities outlined, Baltic Orthoservice looked into the metrology market, to discover what options were available. A handful of metrology manufacturers were consulted, including Nikon Metrology. With competitors offering similar solutions, it is important to identify which best fits the requirements outlined. For the team at Baltic Orthoservice it was clear that the LC15Dx met the requirements exactly, but it wasn’t until they discovered more about the competitors’ alternative solutions that they knew for sure. As well as the outlined requirements, longevity was also an important condition for Baltic Orthoservice. Whilst the Nikon solution was the best system for the job, the competitor was ultimately rejected due to concerns about potential complications and expensive maintenance. With the Nikon Metrology LC15Dx, there are no moving parts inside – making it a much more reliable choice. Introducing this highly accurate, non-destructive metrology solution to the Quality Control Laboratory gives Baltic Orthoservice a better understanding of its products. The Nikon solution offers better knowledge of what we are manufacturing . It gives better precision and understanding of the 3D-printing errors and deviations. This means we achieve the best product quality and avoid the risk of implant failure during the operation. Implants with Nikon quality assurance are more reliable and it is easier to prove their value.” – Paulius Luksevicius – Engineer of Mechanics, Baltic Orthoservice. With a better understanding of the additive manufacturing process and ultimately its products, Baltic Orthoservice is able to confidently produce bespoke implants and improve the quality of treatment for patients. To read the full story, download the PDF below. Baltic Orthoservice also uses the XT H 225 micro-CT system in its Quality Control Laboratory. Click here learn more.